The microplastic accumulation in the Great Pacific Garbage Patch has increased 100-fold in the last 40 years, according to a study published this week in the Biology Letter of the Royal Society. This giant non-biodegradable persistent waste patch is around the same size of Texas and its impacts can be nasty. If not disposed of correctly, solid waste (plastic bags, balloons, glass bottles, shoes, packaging material etc) always finds its way to the oceans. 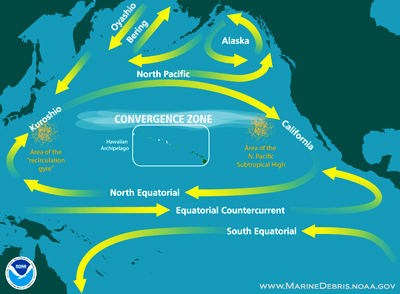 Gyres are areas of convergence that accumulate loads of plastic and other litter, mostly small fragments less than 5mm in diameter, known as microplastic. Some of the most serious impacts of microplastic include the transport of pollutants and the introduction of alien species as well as the risk of ingestion by seabirds, turtles, seals, sea lions, whales, fish and invertebrates. And if fish eat contaminated plastic, these substances might as well end up on your plate. According to a Greenpeace report, around 80% of marine debris is from land-based sources, while 20% is from ocean-based sources such as ships. From these, plastic makes up 60-80% of all marine litter. It would be almost impossible to force countries and governments to “clean” the seas: the costs would just be too high. However, only a “Zero Waste” strategy, together with tight regulation, could keep litter away from our oceans. To learn more about the Seas of Plastic, watch this excellent TED talk by Capt. Charles Moore of the Algalita Marine Research Foundation, who first discovered the Great Pacific Garbage Patch.